Which Company Will Benefit the Most From the Battle Against Obesity? Obesity is a real problem in America today, but investors shouldn’t rush into buying all the fitness and weight-management stocks. Instead they should choose the company offering the best weight-loss results, which will imply strong customer captivity in the mid-to-long term. Based on the results of a November 2013 Gallup survey, the American obesity rate (defined as people with body mass indexes, or BMIs, above 30 as a proportion of the total U.S. population) has reached its highest level in six years. 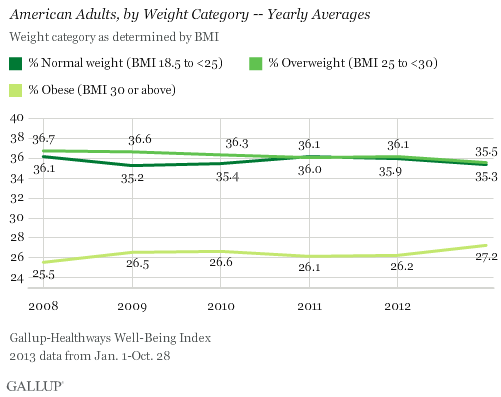 The U.S. obesity rate rose to 27.2% in 2013, compared with 25.5% in 2008. As more people become aware of the worsening obesity situation and its adverse health effects, many more people are likely to increase their amount of exercise or sign up for weight-management programs. This should benefit companies like Nautilus (NYSE: NLS), Town Sports (NASDAQ: CLUB),and Weight Watchers (NYSE: WTW), albeit to different degrees. A 2013 survey conducted by Nautilus indicated that 47% of American adults prefer to work out at home. Factors cited in favor of exercising at home included a lower embarrassment level, the flexibility of exercise attire, and the ability to watch favorite TV channels. Nautilus, a marketer of high-quality cardio and strength fitness products and related accessories for consumer use, remains the best positioned to capitalize on consumer preferences for home exercise. While many people like to work out at home, they are faced with a myriad of choices with respect to fitness products. Nautilus sets itself apart from its peers with its commitment to innovation. Since 2011, Nautilus has inceased its research & development spending to drive new product development. R&D expenses grew by 73%, from $3.2 million in 2011 to $5.6 million, in 2013, and R&D costs as a percentage of sales increased from 1.8% to 2.5% over this period. New products introduced in the past two years included innovations such as CoreBody Reformer and Boost Band. CoreBody Reformer is an all-in-one total body workout machine that offers the flexibility of yoga, Pilates, and dance in one device, while the Boost Band is a 24-hour monitoring band that allow users to track their fitness activities and see if they are meeting their planned targets. The results speak for themselves, with Nautilus growing revenue and operating income by 13% and 49% respectively in 2013. Although exercising in the comfort of one's home is a very attractive thought, most people now spend a lot of their time away from home working. This suggests that a fitness club near one's office might be more convenient. Town Sports, the country's third-largest owner-operator of fitness clubs, offers the best of both worlds to its customers. Town Sports' strategy of clustering its clubs around where its members work and live means that members are more likely to find the right time and place to work out. This is reflected in Town Sports' internal data, which shows that each member visits an average of 1.4 clubs per month. This in turn suggests that members are taking advantage of the company's convenient locations and increasing their exercise frequency. The problem with both exercising indoors and at gyms is that most people face serious issues with self-motivation. Weight Watchers' weight-loss program seems to be more effective than those offered by its peers, judging by its superior retention rates and its customers' weight-loss results. A member stays on Weight Watchers' weight-loss program for an average of eight months, while the typical NutriSystem customer sticks to its meal pack program for only about three months. Furthermore, a 2011 study published in the journal The Lancet showed that people on Weight Watchers' program shed double the weight of those who sought their doctor's advice. Weight Watchers' weight-loss meetings are very successful because of two key factors. First, the meetings are run by former graduates of Weight Watchers' weight-loss program. Their success serves as a strong motivating factor for new participants. Second, there is strong peer pressure. The weekly weigh-ins highlight the disparity in results between those who have made progress and those who haven't, prompting laggards to buck up. Nautilus achieved the best set of results among the three companies, having grown 2013 revenues and operating income by 13% and 49% respectively. Higher sales, particularly from new products, and improved operational efficiency contributed to this strong financial performance. In contrast, Town Sports delivered relatively flat top line and bottom line growth for 2013. Its financial results were affected negatively by more intense competition in Manhattan, resulting in a 13,000 decrease in the number of members in 2013. Notwithstanding the muted financial performance, Robert Giardina, the Chief Executive Officer of Town Sports added that he observed the fitness industry is now growing at a rate unseen in his four decades in the business. Weight Watchers was the worst performer of the lot, seeing its 2013 revenues and operating income fall by 6% and 7% respectively. The competitive threat from free apps and activity monitors was a key contributing factor to the decline. But it's worth noting that Weight Watchers' retention rates remain stable. It is important to look beyond the near-term numbers in picking the best investment candidate. Weight Watchers has an impressive track record of positive earnings and free cash flow in every single year in the past decade. Consumers will return to Weight Watchers in the mid-to-long term, as they realize that it offers the most effective weight-loss program. While Nautilus and Town Sports offer great convenience with respect to exercising at or near people's homes, people will still eventually gravitate toward what works. Weight Watchers represents the best choice for people looking to lose weight because of its effectiveness. Consequently, Weight Watchers is also the best proxy for growth in the weight loss market.